Starting today (July 29), Fleet Foxes frontman Robin Pecknold will be hitting the road without his band, opening up for Joanna Newsom on her West coast tour. This will be the pairing's second tour together, as they also played a series of shows in the spring. 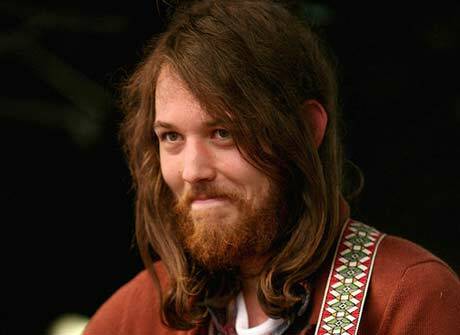 That first outing is now the subject of a 14-minute tour documentary, which you can see over on Fleet Foxes' website. It's a beautifully shot black-and-white documentary, with live performance clips and and behind-the-scenes footage (keep an eye out for Joanna). Considering how sweetly sentimental his music is, Pecknold is a surprisingly funny guy, and the documentary has plenty of good stage banter. If you were concerned about Pecknold's solo dates taking him away from Fleet Foxes, don't worry - the group's website recently posted a series of photos of the band members in the studio. It's clear that they're recording the followup to 2008's outstanding self-titled debut, since the reels of tape are labeled "Fleet Foxes LP2." The words "Silver City" and "Montezuma" both are written on pieces of tape stuck to a wall. Both were titles of songs that Fleet Foxed debuted while on tour, so presumably the band are now laying them down in the studio. See the dates for Pecknold's current tour with Newsom below. Thanks to TwentyFourBit for the heads-up.